Astronomy.—This coming Tuesday, December 8th, that is the day that astronomers around the world will be looking through their Telescopes to watch Venus [Ukali]¹ pass before the face of the Sun. The time to watch around the world is not the same. ¹Ukali i usually associated with Mercury and not Venus. 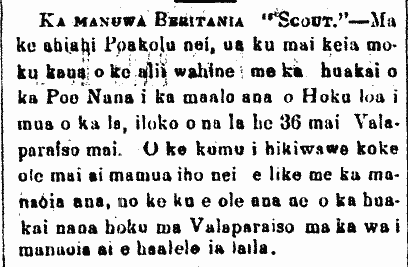 Ka Nupepa Kuokoa, Buke XIII, Helu 49, Aoao 2. Dekemaba 5, 1874.